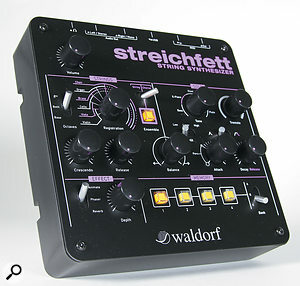 Cosmetically, the Streichfett is very similar to Waldorf’s Rocket synth and 2-Pole, and at 185 x 185 mm it won’t take up too much room in anyone’s studio. String synths, eh? Either you adore them or you can’t understand what all the fuss is about and would prefer to be caught in a Bangkok crack house rather than be seen using one. Me? I have never partaken of anything stronger than a decent single malt in Thailand and, as you might have guessed, I rather like string synths. Indeed, I still own and use the Logan String Melody II that I bought in 1977, and I amassed a few more when, in the 1990s, you could pick them up for the price of a bottle of Bells. But with the exception of a couple of Yamaha FM ensembles released in the early ’80s, strings synths are analogue, and even the youngest are now 30 years old, so there are at least four reasons why you may not want to rely on any of these large, heavy, delicate and potentially unreliable instruments. Consequently, a small, light, robust and dependable MIDI-equipped string synth seems like a damn good idea. Physically, the Streichfett is similar to the Waldorf Rocket and 2-Pole, albeit with a different colour scheme. 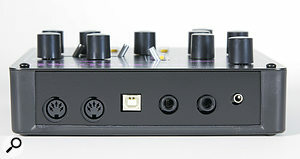 The chassis is plastic and, although the top and rear panels are steel, none of the hardware is connected to these; everything is mounted on the single circuit board that, apart from the knobs, switches and I/O sockets, has so few components that you could cover the lot with a 2nd-class postage stamp. Further evidence of this miniaturisation appears on the rear panel, where you’ll find no mains socket, nor even a low-voltage DC input. At just 80mA, the power requirement is so low that it can be provided via a USB connection. Unfortunately, you can’t pass audio up the USB cable — the audio output is analogue only. This is a shame because, if it were otherwise, you would need just a single connection for audio, MIDI and power. Ignoring the volume control, the Streichfett’s top panel is divided into four sections. The first is called Strings, but this is a bit of a misnomer because it’s capable of generating more than just string synth sounds. The Registration knob controls the initial nature of the sound and, by eliminating the effects, you can inspect the underlying waves. At the knob’s furthest anticlockwise extreme, the sound is close to that of a square wave. Then, as you turn it clockwise, you can hear the sound passing through a wavetable of additive waveforms that offer the desired underlying characteristics for string ensembles and choral patches. The other knobs in this section control a polyphonic AR contour generator (which places the Streichfett in Logan rather than Solina territory) plus a switch to select between 8’, 4’ and 8’+4’ footages. Then there are the all-important chorus/ensemble controls, which I was delighted to find are called ‘MOJO’ on the Streichfett’s circuit board. There are three options here: Chorus (the right position, for slow modulation), String (the left position, for faster modulation), and the combination of the two in the centre position for the full ensemble effect. This description doesn’t convey the range of sounds that you can wring from the Strings section because, even before applying the chorus/ensemble, you can find all manner of basic polysynth pads, chimes, solo strings, organs and male voices lurking within. If there’s a limitation, it’s the low bandwidth of the instrument. Select one of the brighter waves and play up the keyboard, and you’ll find that the level of the sound soon diminishes. What’s more, the amplitude of the notes at higher pitches can be very uneven. I was using a vaguely choral waveform somewhere near the one o’clock position of the Registration knob, and I noticed that the output of an upper ‘E’ was many, many times louder than that of adjacent notes. The difference was so marked that I measured it. First, I played an A: its output was 138mV. I then played the C three semitones above it, and the output was 285mV. I then played the E above that, and the output was 1.05V. Consequently, the upper note of the triad dominated the A/C/E chord, which is quite unlike the response of a traditional string synth. This appears to be a consequence of the formant shaping for the vocal waves and, if so, is understandable, but you should nonetheless be aware of it. Moving on, I adjusted the Crescendo and Release knobs to create suitably gentle attacks and releases, and began experimenting with the three flavours of chorus/ensemble. My preferred setting was the slow Chorus alone, which hurled me back to 1975 — a fine year for string synths. In contrast, the modulation creating the faster effect (and, by extension, the full ensemble) was a little too obvious for my taste. You can mask this using delay and reverb, but I would prefer to see it cured at source. 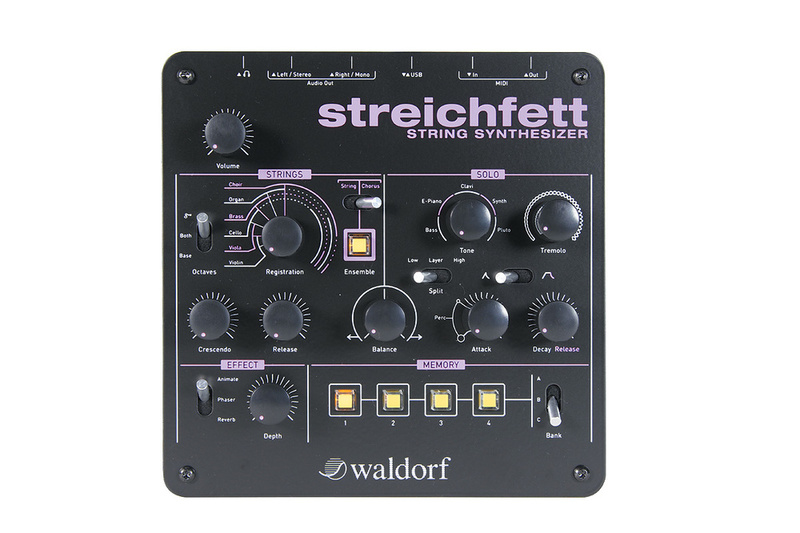 I compared the Streichfett’s String section to a number of classic string synths. I started with an ARP Omni 2, but the sound of the Streichfett didn’t come close; ARPs were famous for their bright and strident natures. My next port of call was my Logan String Melody II. I had expected that the Streichfett would sound rather closer to this, but it didn’t; the timbre was quite different. Moving on, I tried a Roland RS202. I didn’t expect that the Streichfett would be able to imitate its thin, metallic ensemble sounds, and so it proved. Next, I turned to the Roland VP330 Vocoder Plus to see whether the Streichfett could imitate its choral sounds, and the answer was again no. Great sounds? Yes. Identical with the VP330? No. And so it continued... 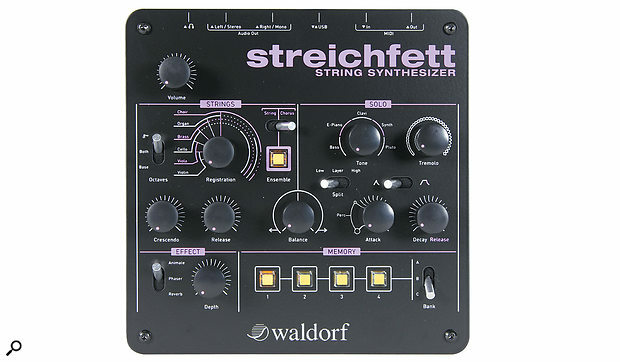 The only string synth that came close to the Streichfett (or, rather, vice-versa) was a Godwin 749 String Orchestra, which offers the unusual facility of allowing you to vary the depths of its dual modulators. By careful adjustment of these (and after applying a large top-end boost to the Streichfett) individual footages could be made to sound almost identical over a narrow range of notes. But as soon as I introduced additional footages or played over the whole width of the keyboard, the differences again became apparent. Then, just before submitting this review, I thought to compare the Streichfett to an Eminent 310 Unique, which provided the organ/strings for Jean Michel Jarre’s ‘Oxygene’. Blimey! The sound may have been slightly different, but the character was very similar. If you’re an aficionado of these instruments, you’ll know that a truly polyphonic 310U with a slow crescendo is the stuff of dreams! The second sound generation section is called Solo. This doesn’t imply that it’s monophonic, any more than the Great on an organ implies that it’s somehow better than the other manuals, or that the Swell should appeal to Americans. In fact, the Solo is eight-note polyphonic, and would more usually be called the Synth section. I turned the Balance control that bestrides the line dividing the two sections fully clockwise to hear the Solo in isolation, and it became clear that the waves within it, selected using a knob equivalent to the Registration in the Strings section, are based largely on variations of pulse waves. These are then subjected to a bit of gratuitous PWM and some preset dynamic filters to obtain a range of sounds described as bass, e-piano, Clavi, synth and Pluto. (Why Pluto? I haven’t a clue.) A switch selects between AD and ASR contours, with the Attack knob adding a percussive thunk between the eight o’clock and 10 o’clock positions. A fourth knob applies tremolo when the Streichfett is used monophonically and auto-pan when patched in stereo. You can apply a key-split to the Solo section, although this doesn’t work as I had imagined because the Solo is always layered with the Strings. Happily, there’s a workaround. When you select the primary MIDI channel to which the Streichfett responds (say, channel 14) the channel above this plays just the Solo section. If you then set the Split to the bottom of the available keyboard range and select Low so that the Solo plays below this (ie. not at all), the Strings section alone plays on channel 14 and the Solo section alone plays on channel 15. It’s quite simple once you’ve tried it, but it would have been far simpler had Waldorf implemented a true split in the first place. The effects section comprises just one three-position switch and one knob. Simply select an effect and adjust the knob to obtain the desired effect. All three effects are permanently active, so moving the switch from one to another doesn’t defeat it; it just means that you can now adjust the depth of the one selected. Animate acts only upon the Strings section, applying an LFO to modulate your position within the wavetable, and the knob simultaneously controls the modulation depth and, to a lesser extent, its rate. Even at the knob’s most clockwise position, neither parameter is particularly extreme, but a range of interesting effects can be obtained. However, you have to be careful when the initial waveform lies at, or close to, one of the significant timbral jumps within the wavetable. There’s no interpolation of waveforms, so you’ll obtain a (probably) unwanted rhythmic effect at the modulation speed. Likewise, the knob simultaneously controls the depth, rate and feedback amount of the phasing effect. I was disappointed by this. The settings are surprisingly mild, and nowhere does it generate the whoosh of, say, the ElectroHarmonix Small Stone that I left patched across my RS202 in the late ’70s. The manual implies that the phaser affects both the Strings and the Solo, but this proved not to be the case — it’s only applied to the ensemble sounds. Finally, there’s a surprisingly usable reverb, which treats both the Strings and Solo sections. Waldorf claim that the knob controls the mix, size and damping of the effect, and this results in a bathroom reverb near the most anticlockwise position, and a huge cathedral-esque effect at the other extreme. The last section saves and recalls the 12 memories, arranged in three banks as A1 to C4. Press a button briefly to select one, or hold it for a second or two to store the current settings. A memory contains every top-panel parameter plus the position of the controller’s modulation wheel (MIDI CC1) at the time that the memory was stored. This confused me for a while because the mod wheel on my controller was always kept at zero, so I became convinced that the source waveforms had a permanent vibrato until I worked out what was happening. Nowadays, it’s trendy to decry string synths, but their impact was huge after they appeared in 1972. Instruments such as the Eminent, the Solina, the ARP Omni, Roland RS202 and the Logan String Melody II helped to define the sound of the mid- to late-’70s, yet, despite the power of modern synths, nothing has ever quite succeeded in replacing them. Some people have suggested that the master-oscillator/divide-down architecture of the earliest string synths is a large part of the reason for this. Waldorf agree, because the Streichfett imitates this. I patched its output to an oscilloscope and played a single note without modulation or effects. I then played another and observed the waveform. I then released the second note, and played it again. The same waveform appeared, which is not the result that one would obtain with free-running oscillators. Another important aspect of vintage string synths was their polyphony and, with its 128 voices, you can treat the Strings section of the Streichfett as fully polyphonic. Whether the eight-voice limit of the Solo section will prove to be a drawback is another matter, not least because instruments such as the simple electronic pianos it imitates were also based upon fully polyphonic divide-down sound generators. But if we move beyond analysis of its technology, there’s no doubt that the Streichfett is a very accessible and playable instrument and, despite its paucity of controls, the range and quality of the sounds that you can coax from it is rather impressive. In fact, it’s hard to wring a useless sound from the Strings section, and I was surprised by the eerie timbres that I could obtain as well as its unusual organ sounds. In contrast, I suspect that many people will dismiss the Solo section. It offers few of the facilities found on even the most limited of modern synths and, with the exception of the Clavi, generates sounds that are only vaguely reminiscent of their descriptions. Nevertheless, I found it quick and easy to find many usable sounds within its simple architecture. 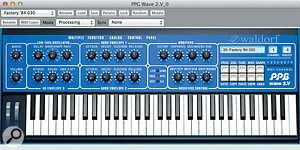 For example, I used one of the Pluto waveforms to create a pleasing lead synth sound by setting the pitch-bend to seven semitones using the arcane combination of controls that allow you to do so, adding a bit of percussion using the Attack knob, setting the Release to zero, adding vibrato by offsetting the mod wheel a tad, and applying a bit of reverb. Intrigued by the success of this, I sequenced a short ditty using nothing but the Streichfett and a Roland TD3KW drum kit, and I must admit that I was pleasantly surprised by the results. What’s more, the sounds I used weren’t static or boring (unless I wanted them to be) because any changes that I made to the physical control settings could be recorded as MIDI CCs. And, in addition to the mod wheel, sustain (CC64) is recognised, although this only works in the ASR mode of the Solo section, and then only on its Sustain rather than its Release. Inevitably, I discovered a couple of bugs during the course of this review, but I’m sure that these can be corrected with a software revision. Firstly, switching on the Strings’ ensemble reduces the volume of the Solo section even though it should have no effect upon it. Likewise, turning on the phaser slightly mutes the Solo section, even though the effect isn’t applied to the sound. More worrying is the lack of a tuning control, either physical or provided via MIDI. The manual (which has to be downloaded — only a quick-start guide is included in the box) suggests that tuning and transposition are available via SysEx, but this isn’t going to be much help if you need to tweak the Streichfett in a hurry. I think that this needs to be addressed. Finally, there’s a confusing error in the manual, where the descriptions of CC70 (registration) and CC71 (string octaves) have become mixed up. But be assured that the CCs work as they should, not as described. If you want to access the sounds of classic instruments without lugging them up and down numerous flights of stairs, you can turn to a soft synth such as GForce’s VSM, which generates a huge range of sounds based upon the original instruments. In contrast, the Streichfett has a limited range of timbres that veers toward the ‘lush’ end of the spectrum, and you’ll not obtain anything like the sounds of the Roland RS202 or Korg PE2000 from it. But if you approach the Streichfett as a new instrument, the answer to my question may well be ‘yes’. Its strings and choral sounds will fill the void if you have no space for a collection of vintage string synths, and at a fraction of the price. Sure, it could have been implemented as a soft synth with a wider range of facilities, but that misses the point. I like instruments that do a single job well, and the Streichfett fits that description admirably. In the past, I have been critical of Waldorf for releasing complex and unfinished synths, but not today. Notwithstanding a couple of bugs, the Streichfett worked as promised from the moment that I took it out of the box. If I were ever to recreate the music that I wrote in the late ’70s (“Please, no!” I hear you cry, and with good reason) I would be sorely tempted to use one. A far as I’m aware, there are no direct alternatives to the Streichfett; your options boil down to buying a number of vintage string synths, or obtaining some of the dozens of string synth sample libraries out there, or installing a software instrument such as the GForce Virtual String Machine. Whether due to space constraints or finances, the first of these is unrealistic for most people, and the second limits you to just a few snapshots of the original instruments. So the search for an alternative leads to a straightforward shoot-out between the Streichfett and the VSM. If you want something imitative with a huge range of voicing options and you don’t mind running it on a computer, the soft synth is an excellent instrument. If you want something with a slightly different character and you value the ‘hands-on’ approach, the Streichfett is worthy of serious consideration. Waveform generator - String section: string/organ/choral wavetable. Solo section: bass/e-piano/clavi/synth/Pluto wavetable. Polyphony - String section: 128 voices. Solo section: eight voices. String footages - 8’, 4’, 8’ + 4’. Key split modes - Solo section: upper/lower/all. Contours - String section: ASR. Solo section: Switchable AD or ASR. Effects - String section: off/chorus/strings/ensemble. String section: animate & phaser. Solo section: tremolo/auto-pan. Global: reverb. Audio outputs - Stereo on twin quarter-inch TS jacks. Headphones on 3.5mm TRS jack. MIDI - In/out on five-pin DIN and USB. The powers-that-be at Waldorf generally choose English names for their products, and ‘Pulse’, ‘Rocket’ and ‘Wave’ aren’t going to strain your inner polyglot. But the Streichfett breaks the mould, not only because it’s German, but because there’s no direct translation into English. Taken literally, ‘streich fett’ means ‘spreadable fat’, although streich can also mean ‘to bow’ as in ‘to bow a violin’. So, in this context, Streichfett means butter, margarine or ‘the fat sound of bowed instruments’. Who says that the Germans don’t have a sense of humour? Given the Streichfett’s size, it’s not surprising that there’s little by way of I/O on its rear panel. 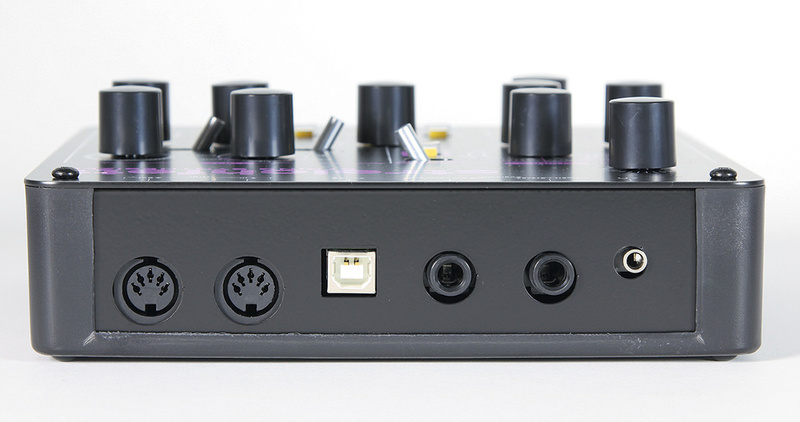 Audio output is provided in stereo via quarter-inch jacks and a standard 3.5mm headphone socket, and these lie alongside traditional five-pin DIN sockets and a USB socket that carries MIDI In and Out (but not audio, which is a bit unusual in this day and age). The USB socket is also the means by which you power the unit. If you don’t have a computer to hand, you can provide the necessary 5V DC using the supplied PSU and cable. 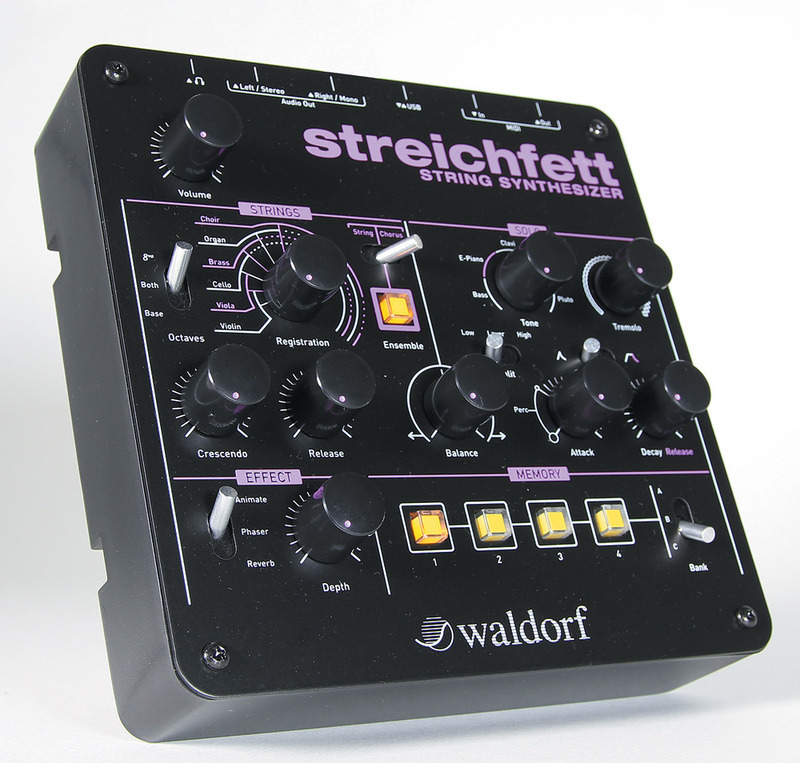 All owners of the Streichfett are invited to download a complementary copy of Waldorf Edition LE. This contains constrained versions of the Waldorf Attack percussion synth, the D-Pole filter and the PPG Wave 2.V soft synth. You may think the marriage of a lush, hardware string synth and a set of plug-ins (and in particular, the famously glassy sound of the PPG) to be a strange one but, as freebies go, this is a very useful one. 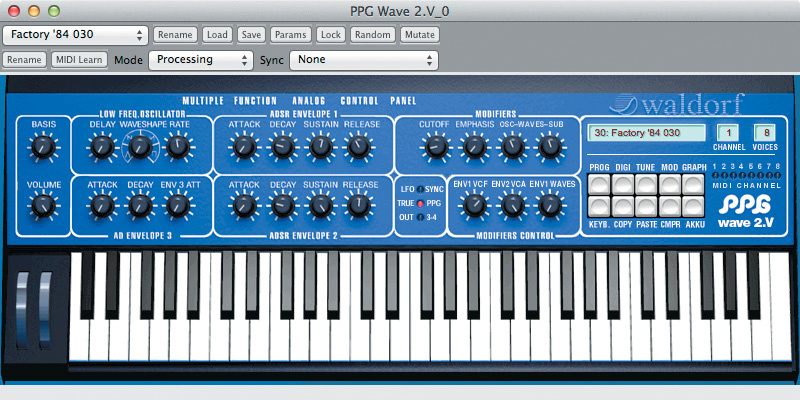 If you haven’t tried PPG 2.V, I urge you to do so. If you like it and later want to upgrade to the full version of Edition you can, and then you can upgrade further to the latest PPG Wave 3.V should you wish. It’s small, light, immediate and simple to use. It can sound excellent; it’s hard to obtain bad ensemble sounds from it. There are a couple of bugs that require fixing. There’s no tuning control, either physical or via MIDI CC. String synths disappeared in the 1980s, but the need for their sounds remains, which is why you now see the best of them selling for prices approaching (and sometimes exceeding) £1000$1000. Had I thought of reinventing the species as a small, MIDI-controlled box with a character that approaches, but never quite overlaps, that of its predecessors, I might have done it myself. Well done Waldorf for spotting the gap, and for filling it with something so usable and so affordable.